Announcing the winners of the 25th ever Right Place Photo Caption Contest! Presenting the top twenty (plus) captions for this picture from AP Photo/Lisa Kyle via Yahoo! 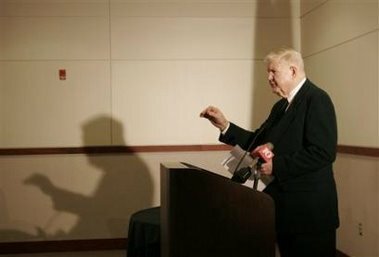 Congressman Murtha, having just emerged from his burrow, spots his shadow... meaning three more years of Democrats whining about President Bush! "Just me... and my sha - dow. Just me... and my sha - dow. Tryin' to make Bush feel blue." Then goin' back to bed." "Ok, boys, 'Sweet Surrender' on the count of three. And a-one and a-two and a . . . "
#19: Evidence that, despite claims to the contrary, Congressman Jack Murtha (D-PA) really does love the spotlight. #18: "It's not a duck, people, it's a chicken!" #17: "...And this one's a duck. And this one's a snake. And this one takes lots and lots of practice: a yellow-bellied, lily-livered..."
#16: "...And if you make your hand tremble just a little like this, the shadow looks just like Jacques Chirac!" #15: "Even Kermit the Frog thinks Iraq is a quagmire, see?" #14: Even Murtha's shadow tried to distance himself from the Senator's stance. 2) The fact that Mr. Murtha appears to be immobile rather than in retreat. #12: "We have to get our troops out now! And you don't even have to take my word for it -- just ask Mr. Hand, he thinks so too!" #11: Moments later, Congressman Murtha's shadow stomped out of the room in disgust. 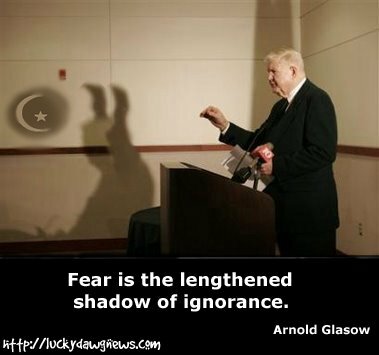 #10: "And my next shadow puppet is a white rabbit... Just kidding, President Carter... sit back down!" #9: "You guys are not following my direction! This is means crescendo, not dolce! I swear this is the last time I work with the Boston Pops!" #8: Despite his incomprehensible call for America to surrender to the terrorists, Democrats felt Rep. Murtha cast a large shadow on the Iraq War debate. #7: "How dare you question my patriotism? This shadow served in Vietnam! In fact, John Kerry once rescued this shadow from the waters of Cambodia! On Christmas Day!" #5: "...And when Dubya said there was a shadow government, this is exactly what he meant!" #4: Hold on... I know this one... it's a coward talking to Señor Wences! #3: "Maybe I can make my geopolitical theories easier for you people to understand by employing the services of my little shadow puppet friend, Quisling, the Surrender Duck." #1: "Stop questioning the shadow's patriotism!" This week, a first --- not one... not two... but three - count 'em three - photoshop submissions! "Yes I would withdraw from Iraq if I were President Bush, and no I've never heard the story of Dionysius and Damocles." And, in case you haven't yet seen it, here are the updated overall rankings for the first 20 caption contests!!! "I Don't Support Our Troops!" Now That's the Way to Celebrate a Blogiversary! The Greatest Blond Joke... EVER!